Like the Daimler, this kit was very easy to build, perhaps even more so. Again, measured against the dimensions included in the instructions, the kit scales out exactly to 1/72nd. Also like the Daimler, the finished model once again looks too "clean" for some reason. I have no references on either of these vehicles, so I am not sure if they are missing any rivet detail or whatnot. The hull assembly was more straight forward than the Daimler's. Everything fit perfectly. The wheels attach to metal rod axles that allow them to turn, but I glued mine in place. There is no undercarriage to speak of, but I am unsure if this was also the case on the real vehicle. A spare wheel in included for attaching to the forward hull. The commander's hatch can be opened or closed, but the hatch needs to be cut into two pieces if you want it open. 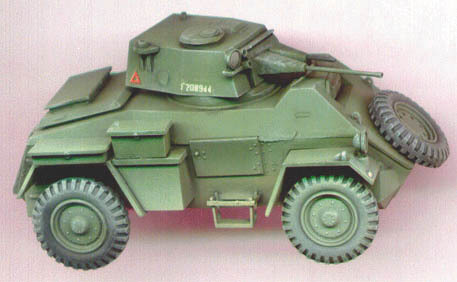 The same commander half-figure is included in both the Daimler and Humber kits. I drilled openings in the two smoke grenade launchers next to the cannon. The cannon and machinegun can be glued in either of two positions: horizontal, or slightly elevated. This kit contains slightly more stowage than the Daimler, including racks of water cans, and some stiff looking bed rolls. I haven't yet attached them to my kit pictured above, but someday I will load this car down with tons of stowage to give it that "lived in, used and abused" look. I painted mine in olive green for an European theater example, and used the kit decals, which were a bit thick, but very well printed.